Home › Cruises › Blog Entry 4: Life on board an ocean cruise! Blog Entry 4: Life on board an ocean cruise! Most of the MSM-74 scientists in the CTD watch room. I am in the middle with the blue shirt, to the right are from nearest to farthest: Sunke Schmidtko, Marie Hundsdoerfer, Ciara Willis and Johannes Karstensen. On the left are: Arne Bendinger, Rene Witt, Ilmar Leimann, Dasha Atamanchuk and Claire Normandeau. Missing from the photo are: Thea Siuts and Alexandre Barboni (Photo Credit: Joachim Ribbe). Some of you have maybe wondered what life on a research ship is like. Maybe because you are about to embark on a cruise of your own, or maybe you are just curious. For me this is my first oceanographic cruise and even though I have only been on board for a week, I feel the ship routine settling in. Time to write a blog entry about a life at Sea! 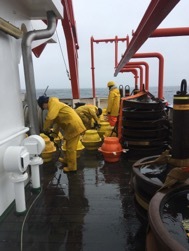 Most of the scientific work on board MSM-74 is centered on mooring and CTD work and we are all assigned shifts in which we carry out shared scientific duties. My shift for example is from 8 Am to noon and from 8 PM to midnight. During this time, we watch the CTD as it is collecting ocean data in the control room and then take bottle samples of salt and oxygen once the CTD is back on deck. 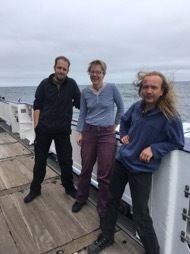 During mooring work we are mostly on deck helping the crew and the three GEOMAR technicians Christian Begler, Rene Witt and Wiebke Martens with getting instruments ready. Often other shifts will help out on mooring work as there is a lot to do and the work can be physically demanding. 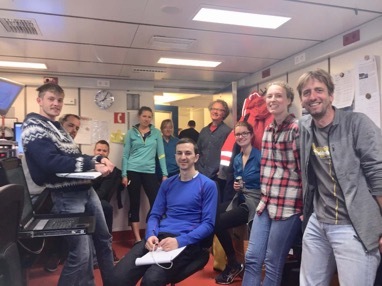 Every day at 1 PM we have science meetings were progress and plans are discussed by the chief scientist of our cruise Johannes Karstensen from GEOMAR. This is the time ask questions and sometimes it is also a good place to share the results of your work. For example, today Penny Holliday who I interviewed in Blog #2, described her OSNAP work and some of the surprising results that came out of OSNAP with respect to the role of the Labrador Sea in the overturning circulation. Our kitchen team feeds us well with three hot meals a day. Breakfast is from 7:30 to 8:30, Lunch is 11:30 to 12:30 and dinner is from 5:30 to 6:30 PM. And don’t forget the cake at 3 PM! Typically meals are eaten by the first shift to relieve the other one so they can eat as well. 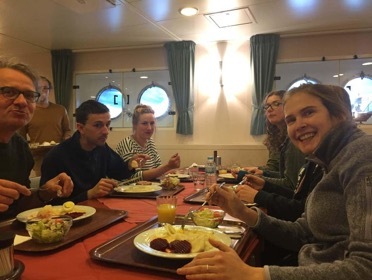 Everyday the fantastic chefs of MSM-74 prepares vegetarian as well as meat options for everyone on board. If one is afraid of missing out on a meal the person can request their meal to be kept in the fridge to be eaten later. Sylvia, the stewardess also runs the ships store were twice a week one can purchase a few necessities such as fruit gummies, chocolate or toiletries. The typical after work beer is allowed on board of course so the shop also offers duty free beverages such as beer and liquor. Eating “Mustard Eggs” “Eggs with mustard sauce and beetroot” for dinner. A traditional German dish! (Photo Credit: Joachim Ribbe). After a hard day working on deck there are various ways to relax such as going to the ships own Sauna with a real Finnish made sauna room and beach chairs to relax afterwards. In ships storage area there are table tennis, darts as well as a foosball table and they often become the center of socializing after work shifts are over. In the ship’s own bar one can purchase drinks and relax in leather chairs to the sound of music or an interesting conversation. Game nights are also held there and it’s a good meeting place to talk more to the crew. I hope this summary of typical day on board and the different routines help paint a clear picture of life at sea on the Maria S. Merian. We are now close to Greenland on our month long cruise and I am excited for the next couple of days enjoying Greenland’s coastline.